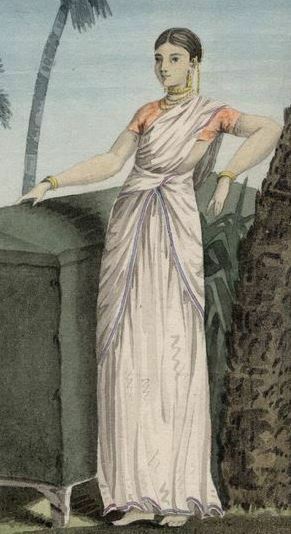 This entry was posted in 1870s, 19th century, 2017 posts, Bengal, British Raj, Colonial, costumes in art, Dress Reform, Early 19th century, fashion, historical costume, Indian Aesthetics, Indian Costume, Indian fashion, Indian Women, Late 19th century, regional styles, Sari, Sari Blouse, sari drape, sari history, Women and tagged 1870s, Bengal, Bengal Sari, Brahmika, historical fashion, Parsi sari, saree drape, sari blouse, sari history. Bookmark the permalink. Its really fascinating. Would you have some idea about the kind of clothes they would wear in the 15-16th century. Eastern India. Especially in the hills???? Hi thanks for the comment . That’s quite a specific question. Usually one relies on accounts in books, temple sculpture and the like to reconstruct the kind of costumes worn. Eastern India and hills is a fairly large area so its a little hard to say what was worn. I might do a Eastern India post later and will include any material on this that I come across.